When an overthrown dictator returns with a huge army supplied by an unknown nation, you have been deployed to strike back against this new threat and return stability to the region. 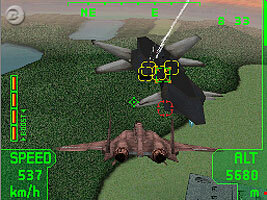 As a member of a squadron of fighter pilots, you have to choose your fighter jet and take to the skies on missions to bring down military targets. You have guns, missiles and bombs at your disposal, and an advanced targeting computer that locks on to enemies in your range. Play over the Nintendo Wi-Fi Connection for co-operative dogfights, one-on-one battles and a range of minigames.